I first got introduced to Firoozeh Dumas's writing through her memoir-of-sorts, Funny in Farsi. 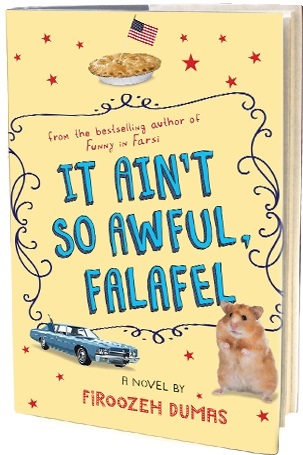 Being an Iranian American who lived through the Iran Hostage Crisis as a youngster, Firoozeh is both wise and pragmatic, always ready to state what she feels is right with just the right touch of humor that takes away the edge and makes you ponder on the realities of the situation. Her writing is honest and brilliant -- she spins poignant moments into funny yarns that are moving, heart-warming, vivid, and masterly, all at the same time. Zomorod Yousoufzadeh is looking forward to starting middle school right after this summer break. Although born in Iran, she has been in the US for a few years now because her father's job brought them to America and has kept them here. The story starts with her family moving from Compton, CA to Newport Beach, CA. As we enter the story, Zomorod starts calling herself Cindy, after the littlest Brady Bunch kid that everyone loves. Why? Obviously, "Zomorod" is not an easy name to pronounce, and is way too weird-sounding, plus she simply wants to fit in and belong here. "Hi, I'm Cindy" shifts the focus from her nationality to herself as an individual, compared to "Hi, I'm Zomorod." Cindy's dad, an engineer, was sent here to the US to collaborate on building oil refineries. He has studied in the US before and speaks English just fine (but for the accent) and is looking forward to doing the best he can in both his professional and personal life, and loves to talk about Iran and oil refineries with whoever is (un)lucky enough to start a conversation with him. Her mother on the other hand speaks barely any English (except hello and thank you) and feels isolated as a result, but still refuses to learn English and prefers having Zomorod as her translator. What's Cindy to do? Except to tell us readers that she loves her parents very much but that she'd rather keep them hidden till she feels that they are no longer embarrassing to her. Typical tween! Cindy/Zomorod carries the book on her young shoulders with panache. She relies on her inherent sense of humor to tackle life's weird encounters when nothing else would work. With a steadfast fellow bookworm, Carolyn, for a friend, Cindy manages to balance her parent's expectations with her own need to belong, while navigating the student life at Lincoln Junior High, and discovering Girl Scouts, Halloween, and Taco Nights at Carolyn's. Pivoting around the Iran Hostage Crisis, Firoozeh shows us the dark side of our own weaknesses and fears that prevent us from standing up for what we know is right -- how our perception gets easily clouded by collective hysteria. With her sharp insight into human nature and her firm belief that people around the world are not that much different from each other, Firoozeh, through Zomorod's dad, assures us that, "...people like that are not truly horrible; they just need a geography class, a passport, and a few foreign friends." The little nuggets about hospitality culture and the universal language of food can easily be applied to Indians just as well as it applies to the Iranians in this story. In fact, some of the characters in the book could just as well be from India, they'd slide right into their roles just as easily. Which attests to the fact that human beings everywhere are not all that different from each other once we take away the language and the food and the geographical borders -- humans seek the same thing: a sense of community, safety, security, and to live their lives as best as they can. 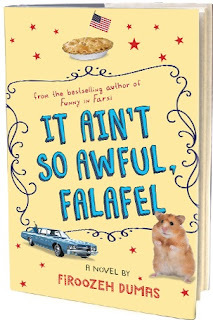 This splendid story mingles family, politics, and immigrant experience, with friendship, self-identity, and coming-of-age angst while addressing paranoia, xenophobia, and intolerance with wry wit and gentle humor. I can easily see this book becoming required reading for all fifth graders so they can peek into the cultural nuances from an immigrant child's perspective, even if the story is set in the 1970s and 80s, with no cell phones or iPods. Speaking from personal experience, I see Zomorod's self-identity as dual, such is the nature of immigrant children -- they manage to extract the best of both worlds and come out a better version of themselves in the end, holding on to what centers them from their own heritage while being open to new experiences and putting out new roots that will anchor them in their current domicile.